Nintendo kicked off an eight-week road trip for Pokemon: Let's Go Pikachu and Pokemon: Let's Go Eevee on Saturday and Shacknews was in attendance. The world of Pokemon invaded Los Angeles on Saturday morning, as Nintendo embarked on a cross-country tour. 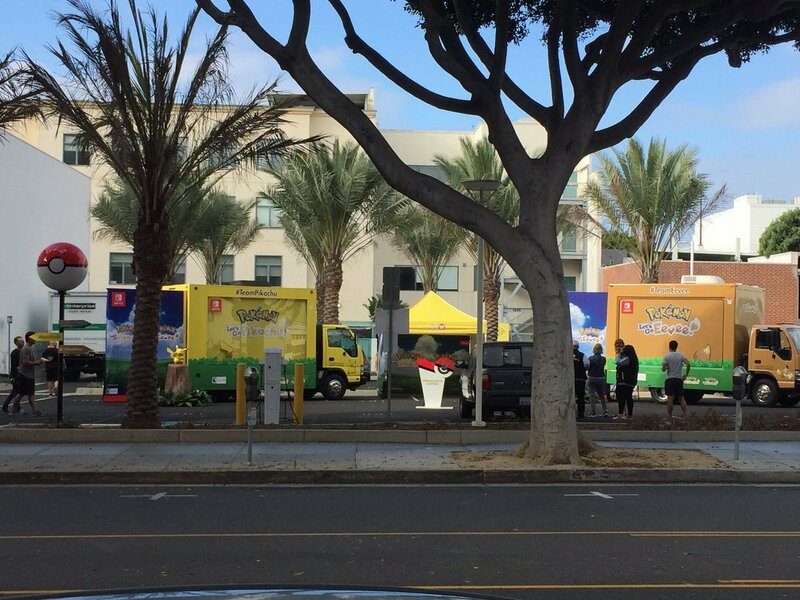 Fans in Santa Monica, just a few blocks east of the city's 3rd Street Promenade, spotted two identical setups featuring demos for the upcoming Pokemon: Let's Go Pikachu and Pokemon: Let's Go Eevee. One of those stations was for Team Pikachu and the other for Team Eevee. Shacknews swung by the pop-up on Saturday morning to check out the fan experience. Two separate station setups housed the game demos, each holding the E3 build for each of the Pokemon: Let's Go games. Players would start off meeting Professor Oak and then wander down Viridian Forest, in a similar fashion to the original Pokemon Red & Blue. Unlike the original classic, the forest would be filled with wild Pokemon, all fully visible to the eye and some even stepping out of the tall grass. Capturing Pokemon is a process similiar to Pokemon GO, as players would use their Poke Ball Plus accessory (tied around their wrist and ring finger) to "toss" a Poke Ball at the screen and capture the wild creature. Like Pokemon GO, odds of capture increase with more accurate throws and successful captures are rewarded with XP. More information on this build can be found in our E3 2018 preview. It only took a few hours for passersby to notice the Pokemon pop-up and for word of mouth to spread. A big line started to form around 5th Street, with curious Pokmeon fans looking to go hands-on with the game and also get a couple of photo opportunities. There were identical photo spots set up, one with Pikachu and the other with Eevee, with Nintendo employees sporting Team Pikachu/Team Eevee letterman jackets on-hand to assist. Giant Pikachu and Eevee mascots were also on-hand to take pictures with children and grown-up Pokemon fans alike. Among them was American Idol alumni Jordin Sparks, who spent a good portion of the morning taking pictures with the oversized Pokemon mascots and going hands-on with the Pokemon demo herself. Nintendo offered up fold-out hats for Pikachu and Eevee to eager fans, as well as the occasional free beanie. This will all culminate with the release of Pokemon: Let's Go Pikachu and Pokemon: Let's Go Eevee, with the final New York stop holding the game's midnight launch. Look for both of these games to release on November 16 on Nintendo Switch.